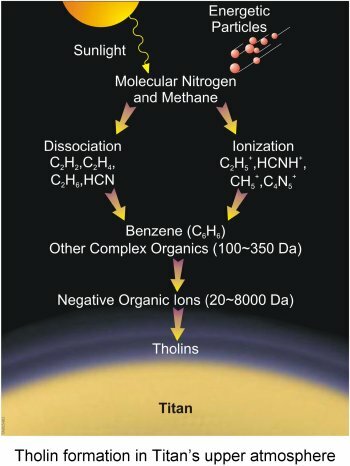 Titan’s Tholins: Precursors of Life? Tholins are interesting molecules, large and complex. They’re organic aerosols — particles small enough to remain suspended in the atmosphere for some time — formed from methane and nitrogen. Their presence on Titan is intriguing because they’re thought to contain some of the chemical precursors of life. That makes studying how they form there a preoccupation with those wanting insight into how life appears. Titan is a wonderful laboratory for such studies. We already knew that nitrogen and methane dominated its atmosphere. New measurements from Cassini now show that tholins form much higher in that atmosphere than was previously believed. The most recent Cassini flybys, though, have also demonstrated the presence of benzene, a key component in the formation of aromatic hydrocarbon compounds. Moreover, Cassini’s Ion Beam Spectrometer (IBS) and Electron Spectrometer (ELS) have picked up the presence of large positive and negative ions. Negative ions, then, seem to have a role to play in the process that makes tholins out of their carbon-nitrogen precursors. And if this sounds completely theoretical, bear in mind that one theory for life’s formation on Earth involves the planet’s bombardment by tholin-rich comets that hauled in the needed raw materials. Tholins are plentiful on the surface of the icy bodies found in the outer Solar System. Clearly, the more we learn about these interesting substances, the more insights we’ll have into the movement of life’s precursors throughout planetary systems around our own and other stars. Image: The tholin formation process. Credit: Southwest Research Institute. Carl Sagan, who did major work on tholins (and, in fact, came up with the term) would have been fascinated with these results. The paper is Waite et al., “The Process of Tholin Formation in Titan’s Upper Atmosphere,” in Science Vol. 316 (May 11, 2007), pp. 870-875, with abstract here. Physicists from the University of Granada and University of Valencia, analyzing data sent by the Huygens probe from Titan, have “unequivocally” proved that there is natural electrical activity on Titan, the largest of Saturn’s moons. The world scientist community believes that the probability of organic molecules, precursors of life, being formed is higher on planets or moons which have an atmosphere with electrical storms. Juan Antonio Morente, from the Department of Applied Physics at the University of Granada, told Servicio de Informacion y Noticias Cientificas(SINC) this summer that Titan has been considered a “unique world in the solar system” since 1908 when, the Spanish astronomer, José Comas y Solá, discovered that it had an atmosphere, something non-existent on other moons.